After his family moved from Florida to New Jersey, it didn’t take long for Conor Davidson to take his mother up on her suggestion that he give lacrosse a try. It was a decision the senior at River Dell High School doesn’t regret. 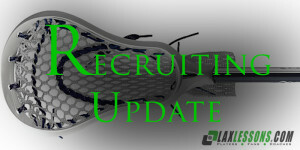 Davidson verballed to attend Division III power Springfield College on Oct. 28, a commitment first reported by Joe Lombardi on LaxLessons.com’s Lacrosse Insider premium coverage section. The 5-foot-9, 165-pound Davidson, a righty, is a dodging, two-way midfielder. An outstanding athlete, he’s also a sprinter for River Dell’s indoor track team. Now, here’s a Q&A with Conor on his commitment. I feel like (Springfield Head) Coach (Keith) Bugbee is a great coach and it is the perfect fit for school. I also like the attention to athletics that Springfield brings. I was considering Frostburg State, Keene State, Lynchburg, Plattsburgh State and Washington & Lee. I had also visited Frostburg State, but once I visited Springfield I knew it was the one. I feel that I am good at moving off ball for the feed. I also feel like I can use my speed to separate from my defender when dodging from the top of the box. I would like to work on my time-and-room shooting to allow me to be a more complete offensive midfielder. New Jersey Empire Elite. I participated in Southern States, Elite 100, Top 205 and the Under Armour Shootout. I would like to thank my parents the most for taking the time to take me to tournaments and to visit schools.